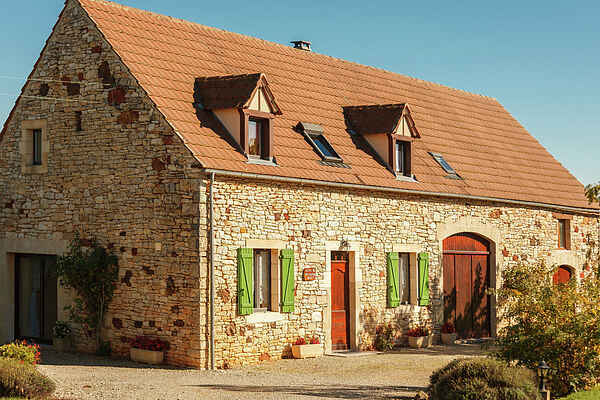 Once a ramshackle barn, now an elegant, detached house. You are surrounded by a large grass garden (with swing) that slopes away gently behind the house. To the rear of the house is also a terrace with fantastic views. You'll truly relax as you take in the calm, peaceful countryside. The holiday home is found on the quiet outskirts of the village of Lavercantière, lying between the towns of Gourdon (18km), Cazals (9km) and Catus (10kn), all with their own charming swimming lakes and beaches. It's a nice drive to Les Arques (11km) with its renowned Zadkine museum. A grocer, restaurant and a simple public pool are within walking distance in Lavercantière. Would you rather ride your bike? There are 8 bikes at your disposal( 5 adult and 3 children's bikes). In Cahors (25km) you can cross the River Lot by its fortified medieval bridge or just wander through the historic center. You should definitely visit the ancient town of Gourdon, so you can appreciate its unique French charm and atmosphere.